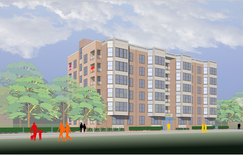 The Hamilton Company Breaks Ground on 49,000 s/f, 48-unit Residential Building at 40 Malvern Street, Brighton, Mass. 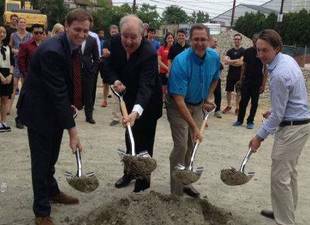 Shown at the ground breaking (from left) are: John Ladt, mayor Walsh's neighborhood liaison; state rep. Kevin Honan; Hamilton president Carl Valeri; and Hamilton vice president Jameson Brown. Brighton, MA The Hamilton Company, one of Boston's largest privately-owned real estate companies, broke ground on a new, 6-story, 49,000 s/f apartment building at 40 Malvern St., kicking off the company's plans to invest $100 million in the Packard Corner neighborhood. The new building, expected to be completed in September, 2016, will have 48 units, each with 2 bedrooms and 2 baths. The units will average 900 s/f and the top-floor units will have views of the Charles River. Rents will start at $2,600 a month. Amenities for residents will include off-street parking, a "green" roof garden, and access to both a Hamilton-owned recreational facility and the MBTA. The new residential units will be built on the site of a parking lot which the Hamilton Co. has owned and operated for more than four decades. Carl Valeri, president and chief operating officer of The Hamilton Co., told the gathering of state and city officials, as well as Hamilton employees involved in the project, that the new residences at 40 Malvern St. are part of a broader plan to invest $100 million in the neighborhood in the next 10 years. "40 Malvern is a collaborative effort with the neighborhood associations regarding the final design and scope of the project," said Valeri. "Located steps from Packard Corner and the Green Line, this residential property is ideally suited for working professionals and graduate students in the area." Valeri said another unique aspect of the development will be the installation of a water management system which will "re-charge the ground water with rain from the roof and other areas of the building." State rep. Kevin Honan said the Hamilton development is part of a real estate boom in Allston-Brighton that will generate 3,000 new units of housing over the next 4-5 years. "New developments such as 40 Malvern St., which combines new housing with increased access to public transit, will keep our neighborhood vibrant for generations to come," Honan said. John Ladt, mayor Walsh's liaison to the Allston-Brighton neighborhood, noted that Hamilton's addition of 48 units of housing fits nicely into the mayor's plans to approve 53,000 units of new housing by 2030. Since the start of 2015, more than 2,400 units of new housing have been built, he said. Brian Golden, director of the Boston Redevelopment Authority, is a native of Brighton and said he takes great interest and pride in seeing organizations like the Hamilton Company invest in the neighborhood. "This project is an excellent example of a transit-oriented development that will transform a parking lot into much-need housing," said Golden. "I congratulate Hamilton Company on its success, and I look forward to seeing the building come to life." Jameson Brown, Hamilton's vice president of development, said the new residential structure, along with others recently completed by Hamilton, "reflects our efforts to develop buildings with moderate rents which are approximately 50% of rents in newly-constructed downtown buildings, while maintaining the framework of the neighborhood setting." Paul Berkeley, president of the Allston-Brighton Civic Association, said his organization strongly supports the 40 Malvern Street project. "The selling point for this project," said Berkeley, "is that it replaces a dirt lot used for parking with much-need housing. It also makes use of nearby surplus parking space for any overflow parking needed for the new residents." Founded in 1954 by real estate icon Harold Brown, the Hamilton Company has amassed more than $1.7 billion in residential and commercial assets in the Greater Boston area. Harold Brown, who frequently gives lectures on real estate investment, is also founder of the Hamilton Company Charitable Foundation, of which Jameson Brown is Chairman. The Foundation allocates millions of dollars to local non-profit neighborhood groups, charities and associations.